The seventh round of the British F3 International Series was held this weekend at the famed Spa-Francorchamps circuit in Belgium with Jazeman Jaafar having a tough time in challenging weather conditions. A fifth place in the first race was a promising start to the weekend, but the second race was cancelled due to torrential rain. 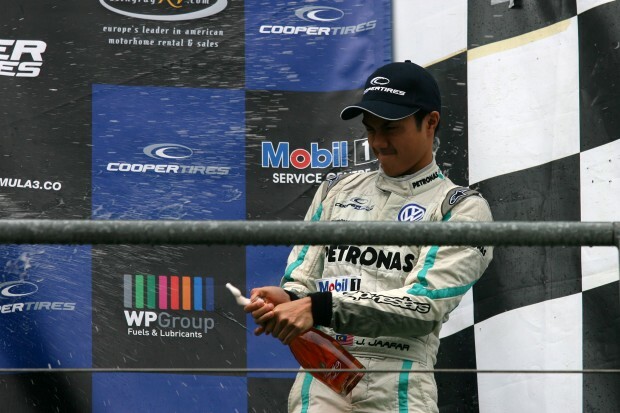 The final race produced a fourth place finish for the Malaysian driver and more valuable championship points for him. Jaafar showed strong form in the early stages of the weekend, topping the timesheets in the first practice session and posting fifth quickest lap in the second session. Moving into qualifying Jaafar continued to prove his consistency, posting fifth and sixth quickest laps of the session. The PETRONAS Talent Programme driver started sixth for the opening race and made a good start and had made up ground to fourth place by the third lap. He held position throughout the race, until main title rival, Jack Harvey, passed him on the final lap, leaving Jaafar no time to regain the place, resulting in a fifth place finish on the track, and fourth of the British F3 drivers, as the weekend’s races are in conjunction with the F3 Euro Series, increasing the field to 29 cars. Jaafar was keen to improve on his performance for the afternoon race, however torrential rain forced the organisers to cancel it and the 19-year-old Malaysian had to wait until the following day to return to the track. With a heavy thunderstorm just before the race, weather conditions were to prove challenging for the F3 field. Jaafar started in sixth place and was quickly up to fourth place, with Harvey hard on his heels behind. He held position throughout the race, defending well against his Carlin team mate, to clock up another haul of championship points and another British F3 podium, after finishing third of the British F3 drivers. Portugese driver, Felix Serralles, enjoyed a strong weekend of racing to overhaul both Harvey and Jaafar in the championship fight, but with four points between each of the top three drivers, it is tight at the top and still an open battle with all three in contention for the title. Jaafar said of his Spa weekend, “I was happy with the start of the weekend and able to run comfortably in the top five, even with the F3 Euro Series drivers. I was a bit disappointed not to take a British F3 podium in the first race, but it was a strong start. I wasn’t so happy when they cancelled the second race as I wanted this opportunity to rack up more points. However, there was no way we could race, as the weather was so bad. Jaafar will have little time to reflect on his weekend, with the next British F3 race weekend taking place in one week’s time, with the grid moving to Snetterton, Norfolk for the next event.